At last, got my 3rd package from MakeupMasala! Was afraid it got lost.. Bought some random stuff too at White Gold store here in Cebu. Will post reviews soon on the Ecotools brush since I haven't washed and used it yet. On the other hand, I got the Life and Companion brushes for less than php 80 each. I read so many good reviews about this brand from Girltalk. I like this compared to my Fanny Serrano angled liner brush (php 150) and Elianto rounded liner brush (php 180). The bristles are perfect! Not too stiff, not so soft! Delivers a thin line and very easy to use since the head is wide.. Doesn't shed.. Soft for a cheap brush.. Use it for dark colors since it hardly picks up eyeshadow pigments. Love it! Its soft and shed's only a single hair upon washing. Got the round lipsticks from White Gold and the rest from Makeupmasala. NYX swatches to follow on my next post. Bye for now since I got a terrible headache.. See ya soon ladies! 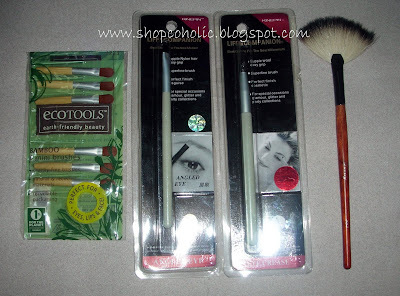 in fact i use it more compare to my ecotools angle brush! haha i waiting for my makeup masala ! i didnt see that brush ! the one u said from china,i wanted one ! sis! ano ba ang pwedeng gawin sa fan brush? nakakita ako ng ganyan sa watsons... ang laki! @aika - i compared the L&C Brush hair its kinda similar to my Lancome eyeshadow brush.. hehe bongga! @ girl with glasses - you can use it for fanning excess product example falling eyeshadow. Also for pigmented blushes for a sheer effect..